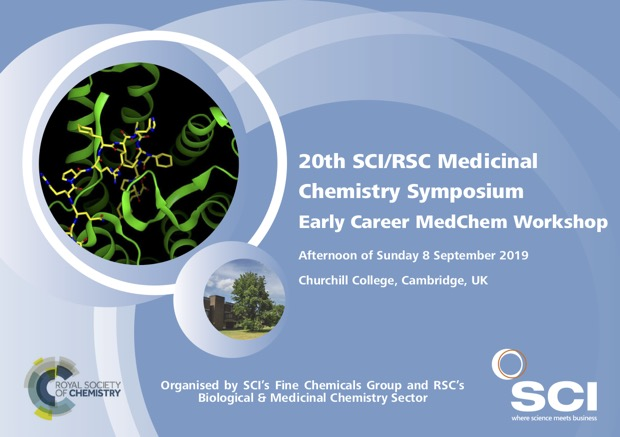 One of the highlights of the SCI/RSC Cambridge MedChem Meetings the Early Career MedChem Workshop, a satellite workshop consisting of a team-based exercise around a virtual medicinal chemistry programme will be held on the Sunday afternoon prior to this event, aimed at early career (up to 5 years’ experience) medicinal chemists. Registration for this event will be at no additional cost to the main meeting, Read the flyer here. 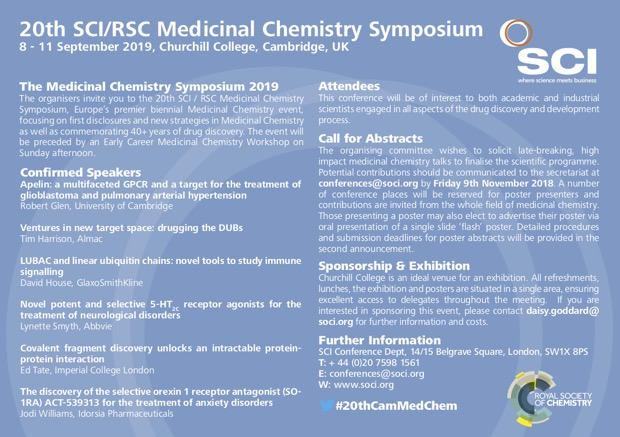 On 8-11 September 2019 we will be holding the 20th Cambridge Medicinal Chemistry Symposium, this marks a significant milestone for this meeting and the committee would like to use the opportunity to highlight some of the first disclosures of now important medicines and other events from the 40 year history of this meeting. We have all the programmes from the 13th to 19th meetings, and I've managed to get details of the first meeting shown in this PDF. If you could share scanned copies of programme from the 2nd to 12th meetings it would be really great. Also if you have particular memories of meetings you would be willing to share feel free to send an email. 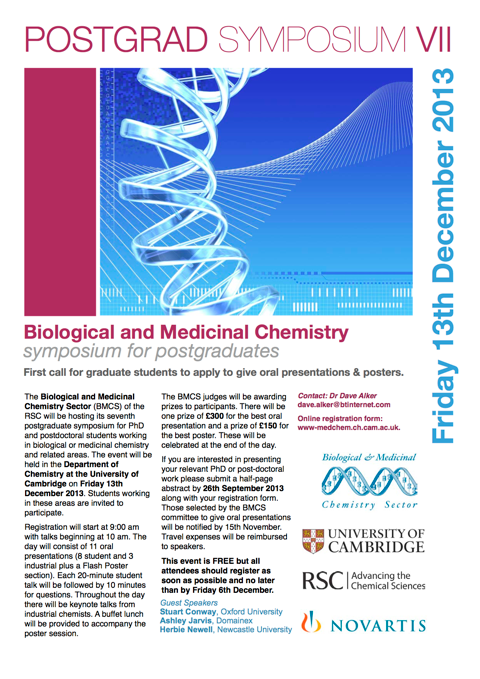 Registration for the RSC 2019 Medicinal Chemistry Residential School is now open, it takes place in Loughborough, UK 2-7 June 2019. Through an in-depth programme of lectures, case studies and hands-on tutorial sessions, this five-day course strengthens excellence in medicinal chemistry by advancing understanding of the factors governing modern drug discovery. Full details are here. Make sure that you register for this course as soon as possible to take full advantage of early bird savings. Registration includes attendance at all sessions, refreshments and lunch on each full day – plus a conference dinner with wine on Thursday 6 June. 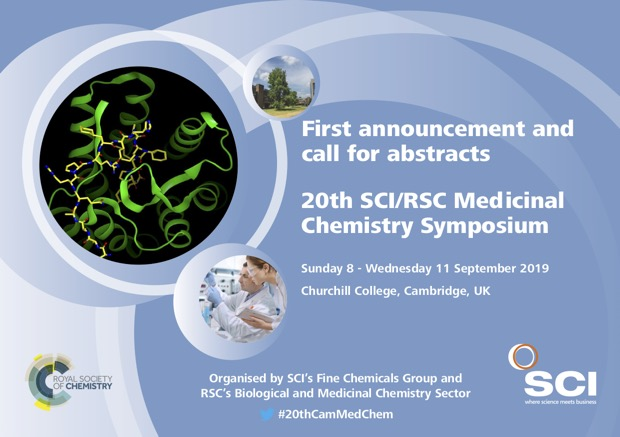 The first circular for the 20th SCI/RSC Medicinal Chemistry Symposium (aka the Cambridge MedChem Meeting) has been announced. This is also a call for abstracts for both oral and poster submissions. Potential contributions should be communicated to the secretariat at conferences@soci.org by Friday 9th November 2018. You can download the full details of the meeting here PDF. A number of outstanding talks have already been confirmed. This meeting is aimed at all those who wish to become better drug hunters and heed warnings from the past. (22 March 2017 09:00-19:00, Cardiff Bay, United Kingdom). Sounds a great meeting both for those starting out in their careers and for those looking to pick up new tips. 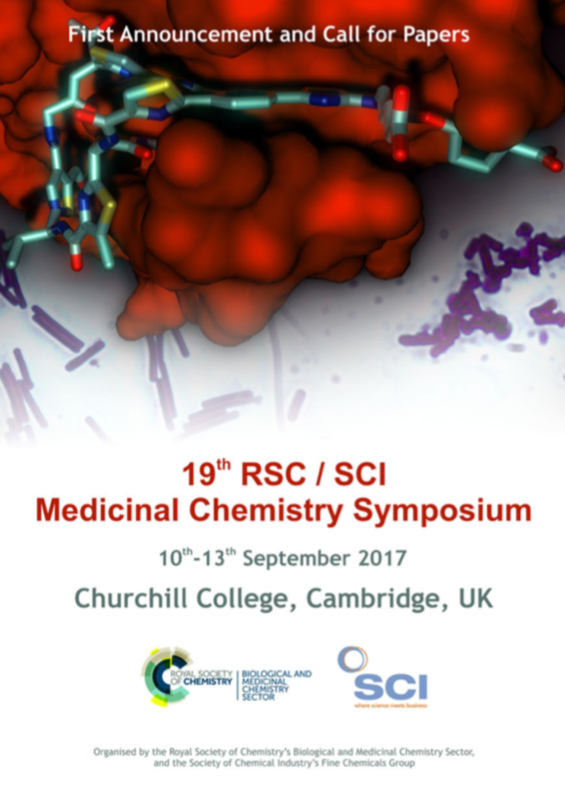 I’m delighted to highlight the first announcement of the 19th RSC/SCI Medicinal Chemistry Symposium to be held in Cambridge in September 2017. Europe’s premier biennial Medicinal Chemistry event, focusing on first disclosures and new strategies in medicinal chemistry. I’ve just been sent details of a new medicinal chemistry course. This course explores how to bring a drug from concept to market, and how a drug's chemical structure relates to its biological function. The course opens with an introduction to the drug approval process. This introduction combines the social, economic, and ethical aspects of drug discovery. Topics include how diseases are selected for treatment, the role of animal testing, and the costs of various discovery phases. 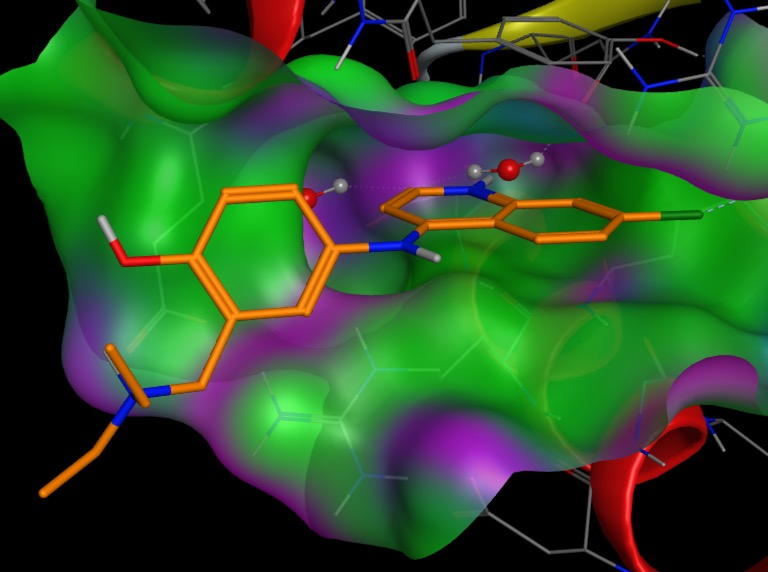 The course then focuses on the scientific side of drug discovery. 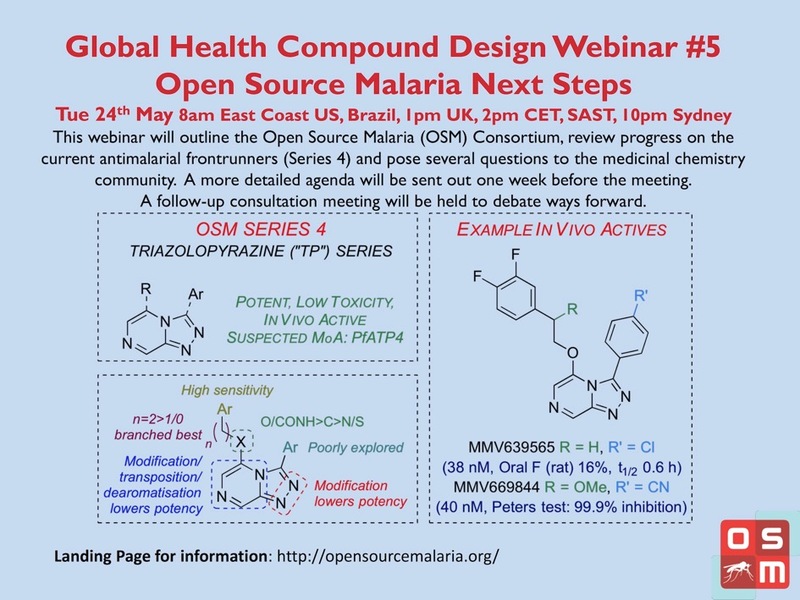 Topics include how drugs interact with biological molecules, drug absorption and elimination, and the discovery of weakly active molecules and their optimization into viable drugs. The course starts 10 March, it is estimated the course will require 6-8 hours per week and runs for 7 weeks. The course was organised by Erland Stevens who wrote the medchem textbook Medicinal Chemistry: The Modern Drug Discovery Process .